Carillion plc run the libraries on behalf of local authorities in Croydon, Ealing, Harrow and Hounslow. We believe that books are just the beginning of what we can do, so in June 2015, we began our exciting new partnership with LEGO® Education, the first of its kind in UK libraries! This has meant far more than just introducing LEGO bricks into the library. For the last eight months, our staff have been delivering workshops using innovative resources from the LEGO Education range. Research from the University of Cambridge, Towards a playful Pedagogy in Literacy, [published here as LEGO - a system for learning] found that by incorporating model-building into discussions around books, children can take control over their own learning. This also allows them to be imaginative, create ideas and share them with others, which in turn will inspire them to write creatively. Literacy and creativity are, after all, at the heart of what libraries are about, and by introducing a hands-on element to the reading and writing process, we can create something very powerful and engaging. When asked about the workshops, children who visited said that they enjoyed using their imagination to build a story! We invested in the full range of LEGO Education products for all the libraries in each of our boroughs and received training from LEGO Education so that we could deliver the pedagogy effectively. These include: StoryStarter, a kit that allows children to design their own storyboards; MoreToMaths, a simple mathematical problem-solving resource that challenges pupils to create structures based on numbers; and WeDo, a resource that combines engineering with computing to get young children involved with programming and real-life science. 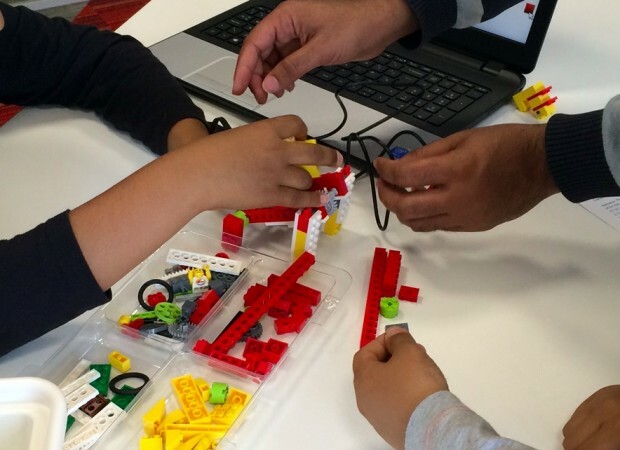 The LEGO Education workshops combine coding with literacy, numeracy and the STEM curriculum. We also run a weekly MINDSTORMS robotics club in 11 libraries across the boroughs, which have been really popular, especially in Croydon where there has been more interest in the area from Tech City companies. Thanks to the LEGO Education sessions, we’ve seen a noticeable increase in the number of people visiting our libraries. The launch events in the Summer of 2015 attracted 290 children and the response was fantastic. The buzz at each event was amazing: all of the children were absorbed for two hours enjoying the activity along with their parents. 83 per cent of visitors told us that the LEGO Education Taster Sessions were excellent, and the remaining 17 per cent said they were very good. Everyone who attended said that they would recommend LEGO Education sessions to a friend! The library staff have been trained by LEGO Education to deliver the sessions which is part of the LEGO Education Innovation Studio Service Level Agreement. There is a small charge for children to attend each session. Although the full range of resources were acquired as an Innovation Studio, the investment is scalable and not all the resources need be invested in at once. Looking forward, we will be developing our partnership with LEGO Education and we are planning to use our libraries as venues for the Junior First LEGO league in May. The Junior First LEGO League is organised by The Institution of Engineering and Technology and encourages teams to solve a challenge using LEGO before attending the event to share individual creations and different solutions. Our library staff have also helped to organise and host a LEGO convention in April for schools in Croydon and neighbouring boroughs. We’re keen to develop links with schools and explore how to work together so that these resources reach as many children as possible! LEGO® Education offers playful learning experiences and teaching solutions based on the LEGO® system of bricks, curriculum-relevant material, and physical and digital resources to early years, primary and after school clubs. In partnership with educators for more than 35 years, we support teaching in an inspiring, engaging, and effective way. Our educational solutions, which range from humanities to science, enable every student to succeed by encouraging them to become active, collaborative learners, build skills for future challenges, and establish a positive mind-set toward learning. For further information about LEGO please contact Elizabeth Moore: Elizabeth.Moore @ mangomarketing.com or Jasmin De Vivo: Jasmin.DeVivo @ mangomarketing.com, and for more about Carillion’s work please contact Fiona: Fiona.Tarn @ carillionservices.co.uk.